From “the clear-eyed poet laureate of baseball”—a definitive collection of three nonfiction classics chronicling MLB into the modern age (New York Post). In these three classic volumes, legendary New Yorker sportswriter Roger Angell chronicles the triumphs, travails, heroes, and history of America’s favorite pastime. 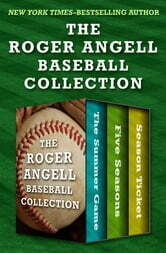 In The Summer Game, Angell covers ten seasons in the major leagues from the 1960s to the early 1970s. With his signature panache, Angell captures the flavor of the game and the spirit of legends such as Sandy Koufax, Bob Gibson, Brooks Robinson, Frank Robinson, and Willie Mays. In Five Seasons, Angell covers the mid-1970s, which he calls “the most important half-decade in the history of the game.” From the accomplishments of Nolan Ryan and Hank Aaron to the rising influence of network television, Angell offers a fresh perspective on this transformative period. And in Season Ticket, Angell recounts the larger-than-life narratives of baseball in the mid-1980s. Diving into subjects including the notorious 1986 World Series and the Curse of the Bambino, Sparky Anderson’s Detroit Tigers, and performance-enhancing drug use, Angell offers insights that are crucial to understanding the game as we know it today.